There is currently a construction project underway near the Testing Center which may create some intermittent noise or vibration in our area. The Testing Center will remain open but please note that there is the possibility of noise during the construction period. We are working with the construction crew to mitigate noise during operating hours, but there will still be some audible noise at times. We will be providing earplugs and/or headsets (if allowed by the test sponsor) to assist students. Please keep this in mind when scheduling your appointment with us. If you believe it may negatively affect your testing experience, you may want to look for another proctoring location. AEC students: We are preparing testing space in Oregon Hall to avoid this issue, and will be scheduling AEC exams there as soon as possible. The University of Oregon Testing Center is responsible for the administration, scoring, and maintaining of records for a wide range of tests administered to University of Oregon students and community members. We work closely with the student population by disseminating information, advising students, and administering exams. We are available to students and community members in need of test proctoring services. 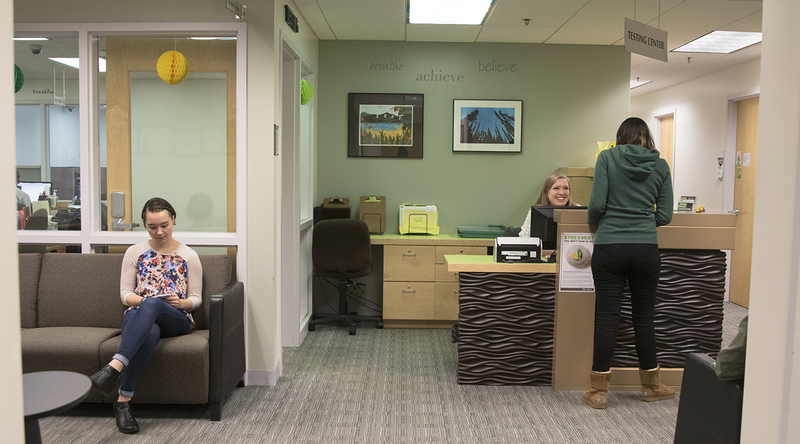 As a member of the Consortium of College Testing Centers, the UO Testing Center assists students and community members in need of an approved location for the administration and proctoring of academic, licensure, and certification exams. Fees for testing are assessed depending on the type of testing that is needed. The Testing Center supports UO's Dreamers and students from all countries. The staff of the Testing Center is committed to providing services to students and community members in support of their educational and career goals. All students and community members who receive services at the Testing Center will be treated with the courtesy and the respect due to them as members of our community. M | 8:00 a.m.–5:00 p.m.
T | 8:00 a.m.–5:00 p.m.
W | 8:00 a.m.–5:00 p.m.
TH | 8:00 a.m.–5:00 p.m.
F | 8:00 a.m.–5:00 p.m. The Testing Center will be closed on all university-observed holidays. We will also be closed on December 24. Beginning May 1, 2018 students will be taking a new math placement assessment. The ALEKS Math Placement Assessment will be taken online and incorporates prep and learning modules that students will be able to use in order to review and improve their placement. Online payment is now available for individuals needing proctored exams. This includes students of online and distance education programs as well as anyone needing a secure proctor site for licensure or certification purposes. Please contact our office at 541-346-3230 or testing@uoregon.edu to schedule your appointment. Payment will be collected on your scheduled appointment date. The Testing Center provides psychological testing only at the request of the Counseling Center staff for UO students. APA ethical guidelines prohibit the use of psychological testing by individuals who are not qualified in administration and interpretation of psychological tests or inventories.